Strategies that empower students to become active, responsible learners, improving student academic success and retention. 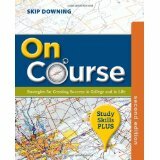 On Course textbook and success strategies is used in classes at more than 500 colleges and university in the United States and Canada, helping to empower more than 100,000 students each year. Improving Study Skills, Soft Skills! Read 15-20 pages per week on the first topics with accompanying journaling exercises.